At age 15, Chelsea Roff nearly lost her life to anorexia. Medical and mental health interventions saved her life, but it was discovering a yoga practice that helped Chelsea to make a full recovery and progress from “surviving” to “thriving.” Today, Chelsea is a nationally-recognized author, speaker and the founder of Yoga for Eating Disorders®, a program that’s being introduced to treatment clinics and yoga studios nationwide. Learn more about Chelsea’s story in the campaign video that launched Yoga for Eating Disorders®. This February, Give Back Yoga Foundation and Off The Mat Colorado invite you to discover Yoga for Eating Disorders® through two weekend trainings in Denver and Boulder. These 15-hour trainings offer individuals practical, yoga-inspired tools to overcome eating disorders or body image issues at all ends of the spectrum. They also give yoga teachers and mental health practitioners the knowledge and skills they need to support students and clients in recovery. Graduates will be eligible to receive Continuing Education Credits through Yoga Alliance, and to become facilitators for Yoga for Eating Disorder® programs. Opening circle and group discussion about the role yoga can play in healing food and body image issues at all ends of the spectrum. Learn how to use yoga to develop a healthier relationship with your body through yogic techniques for tracking hunger and fullness signals, coping with emotions, and cultivating a sense of “home” in your own skin. Includes asana session, group discussion, interactive exercises, and meditation. Despite the tremendous value yoga can offer in the recovery process, yoga can be a double-edged sword for people with eating disorders. On one hand, the practice can teach essential skills for long-term recovery, but the wrong approach to yoga can actually exacerbate food and body image issues. Learn how to use the practice of yoga for health and wellbeing, rather than as a crutch for acting out in their eating disorder. Includes asana session, group discussion, interactive exercises, and meditation. Trainings are capped to maintain the personal and intimate setting required for this deep work. Both trainings are expected to sell out, so please register as soon as possible. Several scholarships are available – for more details, please contact Chelsea Roff. Can’t make it to the training, but want to support Yoga for Eating Disorders®? Make a life-saving donation to this project through our Donate Today page. For every $5,000 raised, we can bring Yoga for Eating Disorders® to one more treatment center and help individuals with eating disorders to discover their own true beauty. Nearly one out of three soldiers who served in Iraq or Afghanistan now suffers from post-traumatic stress, major depression or traumatic brain injury. And tragically…every 36 hours…a soldier commits suicide. Yoga and mindfulness can help veterans to find peace of mind and relief from symptoms of PTSD. You can help Give Back Yoga Foundation to share yoga with veterans by joining Advisory Board Member Desiree Rumbaugh for An Offering of Peace: A Yoga and Music Fundraiser For Veterans on Saturday, January 18th. Led by Desiree and her friend Camilla Sinclair, this donation-based yoga workshop will feature live music by Steve Gold, with all proceeds supporting Give Back Yoga’s campaign to share free Mindful Yoga Therapy toolkits with veterans. You’ll also practice alongside some veterans who have served our country and hear personal stories of how they’re now benefitting from yoga. Details: By donation (suggested minimum donation of $20). Cash and check accepted at the door; make checks payable to Give Back Yoga Foundation. Desiree Rumbaugh travels the world teaching yoga workshops and trainings. She enjoys meeting people and finding out how much we all have in common. She is the creator of the DVDs Yoga to the Rescue, and is a regular presenter at Yoga Journal Conferences as well as a contributor to the magazine. Her classes can now be viewed on My Yoga Online and Yoga Glo. She serves on the Advisory Boards of The Art of Yoga Project, bringing yoga to teenage girls in the juvenile justice system, and the Give Back Yoga Foundation, providing yoga for US military war veterans. Her 20-year-old son, a former Marine Reservist, was murdered in an unrelated incident in 2003 and as a result, Desiree is fiercely dedicated to inspiring others to find emotional as well as physical healing through Yoga. Camilla Sinclair has been dedicated to yoga and the healing arts for 25 years. She teaches yoga at several studios in the San Diego area and is on the staff of the San Diego Veterans Hospital teaching yoga classes for veterans who have chronic back pain. She is also the lead instructor for the newly implemented 4 year study: “Yoga Therapy for Veterans with Chronic Low Back Pain.” Camilla is a Holistic Health Practitioner and Certified Yoga Instructor. She offers workshops in Therapeutic and Restorative Yoga throughout the region and incorporates the beneficial practice of Yoga Nidra to deepen the healing experience. Steve Gold is a conduit for spontaneous transformation using singing and storytelling. He creates powerfully positive music that heals and inspires. His rendition of So Much Magnificence, the title track of his first album, can be heard in yoga studios around the world. Steve teaches “Mantras for Manifestation” and “Voice of Magnificence” workshops, showing people how to use music and intention to actualize their deepest desires. His latest album, Let Your Heart Be Known, has been called “a soulful genre-buster, destined to be a classic” by LA Yoga magazine. Can’t make it to this event? You can still help Give Back Yoga to put free yoga toolkits in the hands of 10,000 veterans this year by making an online donation. Just choose “Yoga for Veterans”when selecting a project for funding. Give Back Yoga is pleased to be partnering with ORGANIC INDIA to bring true mind-body wellness to those in need of healing. ORGANIC INDIA’s vision is to be a vehicle of consciousness in the global market, by creating a holistic, sustainable business model that inspires, promotes and supports true wellness and respect for all Beings and for Mother Nature. By working closely with small family farmers in India, ORGANIC INDIA offers organic, fair-trade tea and wellness supplements that benefit both those who produce them and those who enjoy them. ORGANIC INDIA is offering free variety bags of individually wrapped Tulsi tea to all studios who support Give Back Yoga Foundation. To request your gift, email ORGANIC INDIA. ORGANIC INDIA has also donated 100 gift bags filled with sustainably-grown tea and Ayurvedic wellness supplements to Give Back Yoga this holiday season. We’ll be sending these gift bags to supporting yoga studios and loyal donors as a token of our thanks…and through December 31st, you too can receive one of these goodie bags by contributing $125 to our crowd funding campaign for veterans. This offer is available to just five donors, so don’t delay! Help us meet our goal of putting evidence-based Yoga For Veterans Toolkits in the hands of 10,000 returning soldiers this year by making a donation to our crowd funding campaign. Gifts of any size are welcome – every dollar counts! Coming together for yoga, music and love…while helping to change the world. What could be better? Community seva projects sponsored through yoga festivals are becoming a key way to fuel our work. 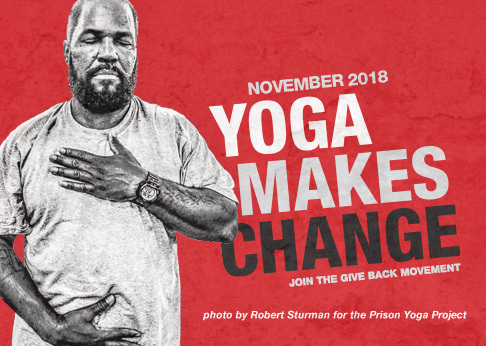 Yogis who support these initiatives are bringing the healing power of yoga to those in need – like prisoners, at-risk teens, veterans and those with eating disorders. Held in a town renowned for its healing energy, this “consciousness evolution conference”both educates and inspires. Featuring over 250 workshops, 108 presenters and 16 musical artists, you’ll hear from authors, speakers and energy healers from around the world; experience meditation, dance and kirtan; and learn from master teachers who will help you bring your practice and service to a new level. Community Seva: Help Sedona Yoga Festival raise $50,000 to fund Yoga for Veterans Toolkits by making a donation to SYF Gives Back, or by signing up to host a team or individual fundraiser on Crowdrise. FESTIVAL TICKET OFFER: Save 20% on a SYF2014 All-Access Pass by entering code “GBYF20” at checkout. Pre-Conference Teacher Training: Join GBYF at the Mindful Therapeutic Yoga Practices for Veterans two-day intensive training to learn clinically proven techniques for working with students who have experienced trauma. You’ll hear from expert teachers like Give Back Yoga co-founder Beryl Bender Birch, Mindful Yoga Therapy for Veterans founder Suzanne Manafort, Prison Yoga Project founder James Fox, Give Back Yoga board member Ann Richardson Stevens and more. The second annual Denver Chant Fest gathers the nation’s top Bhakti (spiritual song) musicians and beloved yoga instructors for a weekend of soul-stirring music, top-notch yoga instruction and offerings from wellness vendors from across the country. The 2014 line-up includes Give Back Yoga’s own Shanti Medina, performing Universal Kirtan with Scott Medina; Jai Uttal; Donna Delory; Rusty Wells; Jason Crandell; Dave Stringer; MC Yogi; C.C. White; Sean Johnson and the Wild Lotus Band; Govindas and Radha; Pete Guinosso; Deepak and the Breath of Life Tribe; Tricia Heimbach; Tina Porter; Patrick Harrington; Dawnelle Arthur; Mike and Robin Konard; Arjun Verma; and many more. Community Seva: Denver Chant Fest is collecting donations for Give Back Yoga, the festival’s designated non-profit partner. To make a donation, visit Denver Chant Fest. FESTIVAL TICKET OFFER: Save 10% on a three-day weekend pass by entering code “GBYF” at checkout. Offer available for the first 100 GBYF community members. Stay tuned for a special ticket giveaway for GBYF supporters by joining our mailing list. We’ve added a very special incentive to our crowd funding campaign to bring yoga toolkits to 2,000 veterans – this gorgeous handcrafted lap quilt, donated by Navy employee and San Francisco Quilt Guild member Patricia McFadden. This work of art, crafted by a quilter who Give Back Yoga co-founder Beryl Bender Birch calls “incredibly talented,” will be gifted to one donor who makes a tax-deductible campaign contribution of $7,500. Through this generous donation, we can bring yoga books and CDs to 1,000 vets and soldiers, offering them simple practices to recover from post-traumatic stress. Learn what real vets are saying about the yoga toolkit. To make a donation, visit our campaign page. Give Back Yoga is excited to announce the launch of a crowd funding campaign on a new platform called Piglt. The campaign aims to raise $15,000 by December 31st, with the goal of sharing yoga toolkits with 2,000 veterans. Piglt (pronounced “piglet”) is a disabled-veteran owned-and-operated business. Piglt’s co-founder, Casey Wallace, served 5 years on active duty in the Air Force as an Acquisitions Officer. With the support of co-founder Vidya Chokkalingam, Casey offered hands-on assistance to further GBYF’s fundraising efforts, with the goal of making an impact on veterans and their families across the world. Most of Casey’s classmates (USAFA ’05) are still on active duty, put in harm’s way every day. Through this fundraiser, Casey hopes to improve their access to the healing practices of yoga and meditation – proven through clinical research to be effective in helping trauma survivors to recover from the symptoms of PTSD. Check out our campaign here! The Mindful Yoga Therapy for Veterans toolkit features simple but effective yoga practices that were developed to help returning soldiers cope with post-traumatic stress disorder, traumatic brain injury and depression. When you purchase this multi-media guide for yourself or someone you know, you’ll gain a valuable tool for dealing with stress and support Give Back Yoga Foundation’s programs for veterans. Executive Director Rob Schware talks with Give Back Yoga Board Member Suzanne Manafort for The Huffington Post Blog about the roots of the Mindful Yoga Therapy for Veterans program, and the amazing transformation that vets are experiencing through the practice of yoga and mindfulness. Click here to read more of Suzanne’s tips for yoga teachers who want to work with veterans – and how she serves as one link in the chain of “spiritual revolutionaries” that teacher Beryl Bender Birch is sending out into the world to make a difference. Do you want to bring the transformational power of yoga and meditation to underserved populations? Join Suzanne Manafort, Beryl Bender Birch, James Fox and other leading experts in Sedona, AZ in February for a two-day Mindful Therapeutic Yoga Practices for Veterans teacher training. Learn clinically-proven techniques to help students recover from trauma and emotional stress at this intensive pre-conference training, hosted by the Sedona Yoga Festival in association with Southwest Institute of Healing Arts. Are you preparing to teach yoga and mindfulness to veterans in your area? It can take more than technical skills to introduce a trauma-sensitive yoga therapy program to your local Veterans Administration facility – and knowing what to expect can make your journey much easier. Get started with this video slideshow produced by Yael Calhoun, founder of the non-profit GreenTREE Yoga, as she shares some tips on how to “get your foot in the door” of your local VA, secure funding for an evidence-based yoga therapy program, and market a pilot program to prospective students and supporters. Help Give Back Yoga Foundation meet our goal of putting evidence-based Yoga For Veterans Toolkits in the hands of 10,000 returning soldiers this year by making a one-time or recurring donation in the amount of your choice. Gifts of any size are welcome – every dollar counts! Our many thanks to Seeds of Service event sponsor Ramblin Jackson for featuring our Yoga For Veterans Toolkit fundraising initiative in his latest “Friday Informal Film.” Check out our spotlight, beginning at the 1:40 mark…and pass it on! Want to help us meet our goal of putting free Toolkits in the hands of 10,000 veterans by 2013? Click here to purchase tickets to the Seeds of Service dinner on September 11th, or to make a donation in any amount towards this fundraising effort. You can also purchase purchase yoga and mindfulness materials for a veteran in need using the “Give a Gift” feature on the right side of this page. Every dollar makes a difference – please help us change a veteran’s life today. We cordially invite you to join the Give Back Yoga community on Wednesday, September 11th for our first annual Seeds of Service dinner, an evening of delicious farm-to-table cuisine that supports the distribution of our free Yoga For Veterans Toolkits. These evidence-based, highly effective practice guides give returning soldiers a valuable resource to overcome post-traumatic stress, major depression and traumatic brain injuries, helping them to make a successful transition back to civilian life. So far, we’ve put free Toolkits in the hands of over 8,000 veterans – and by joining us at this community gathering, you can help us meet our goal of reaching 10,000 returning soldiers in 2013. Read what veterans have to say about the effectiveness of these Toolkits. We’ll kick off the Seeds of Service event with cocktails and tapas at 6 pm at the lovely Lyons Farmette in Lyons, Colorado. At 7 pm, eat Private Chef & Catering Co. will serve up a mouth-watering artisan dinner, prepared with freshly harvested ingredients from the Farmette. We’ll also enjoy the musical stylings of Denver Chant Fest musician Chuck White, and hear a very special presentation by former Marine Corps Intelligence Officer and Military Olympic Athlete Sarah Plummer, the founder of the Just Roll With It! Bootcamp for Transitioning Warriors. A spiritual warrior after our own hearts, “Semper Sarah” is on a mission to empower all those who have experienced trauma or difficult life events. Dinner tickets are available for just $108, with 85% of the proceeds going directly to support Yoga for Veterans. Tickets can be purchased online through Eventbrite through September 11th. Can’t join us this time? Please consider supporting us from home with a donation that directly benefits this fundraising effort. Just visit our Eventbrite page and choose the amount that you would like to contribute. And whether you can join us or not, don’t miss a chance to enjoy 30 free days of online yoga, meditation and wellness videos from event sponsor GaiamTV. When you subscribe through our affiliate link, GaiamTV will donate $20 to our Yoga For Veterans program. Begin your free trial with a special playlist selected by veterans for Give Back Yoga. We thank you for being part of the Give Back Yoga family, and for making it possible for us to support programs around the country that bring yoga and mindfulness to those who need it the most. We look forward to sharing this inspiring evening with you!